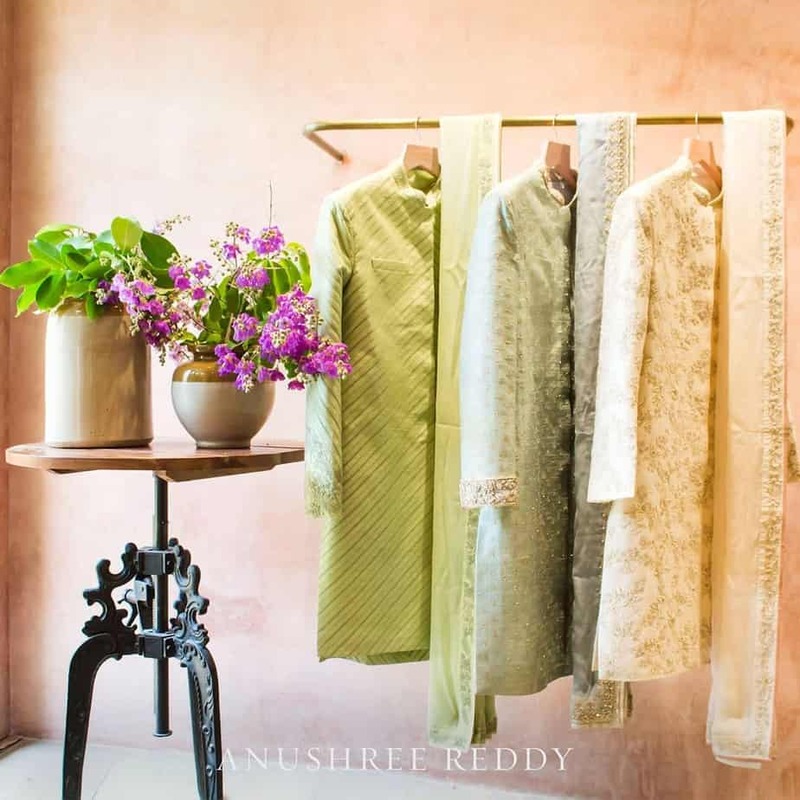 Fashion Trends Anushree Reddy Menswear Collection With Prices! 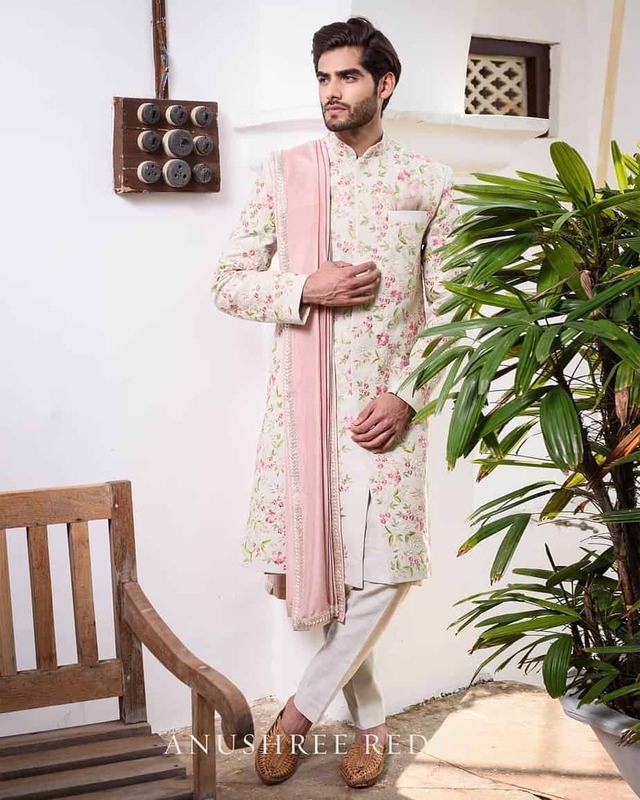 Anushree Reddy Menswear Collection With Prices! If anyone is familiar with Anushree Reddy designs, you must be knowing that she doesn’t usually deviate from her usual designs. Anushree Reddy’s summer collection 2019 at the Lakme Fashion week saw some of the prettiest summer lehengas, some festive wear, and menswear. 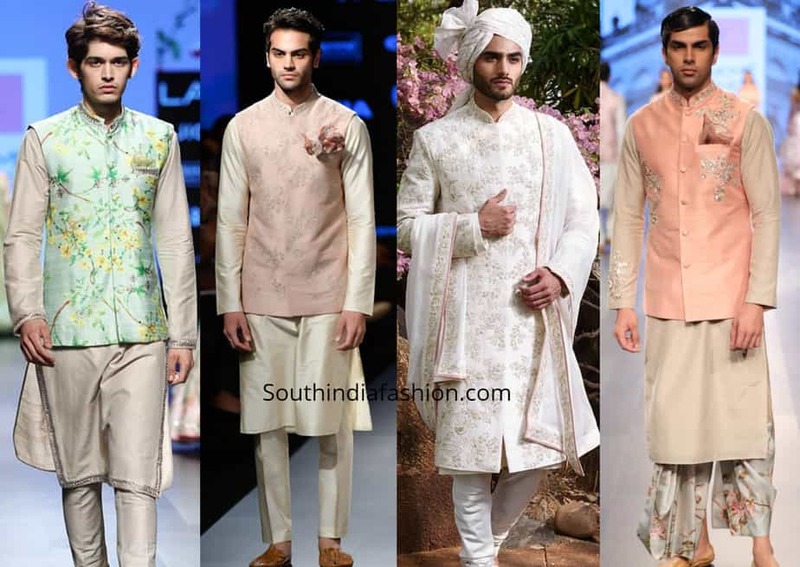 In this post, we are featuring the best of Anushree Reddy menswear with prices. The 2019 collection was titled “Atirah” meaning perfumes and flowers. This year’s collection saw less of her classic pinks & reds while more of deep blues, light pinks, some yellows, and peaches. The collection titled ‘Atirah’ is an ode to the age-old tradition in Kannauj where heavenly oils were extracted to make attar or fragrances from the flowers in the Mughal era. The colors in the collection include hues of Zar(Warm apricot), Fiza(Celestial blue) and Sang Raza(Frosted almond). This is what the designer has to say about her Menswear collection for Summer 2019. This Subtle yet elegant piece features a floral print bandi with a High low kurta & Pyjama. 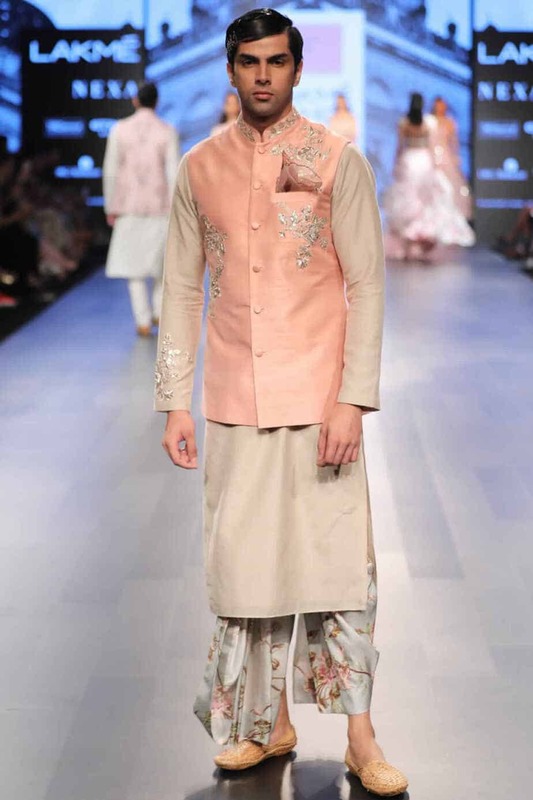 We can easily see grooms wearing this piece to a daytime mehendi function. Easy, breezy and with that pocket square he can even compliment his bride’s outfit. This outfit is priced at INR 67,200. This dull green bandi with a kurta & churidar is perfect for an evening mehendi function or even a sangeet. You can style it with brown brogues. It is priced at INR 89,000. This Ivory Overlap Jacket Set is perfect for a Sangeet function or even reception night. 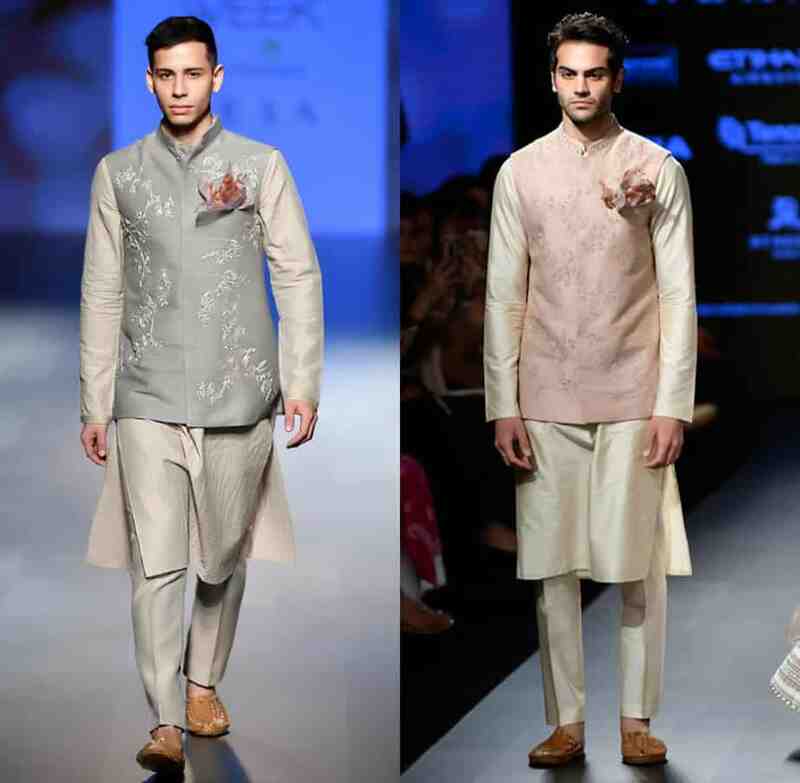 This one is for the grooms who love wearing Indo-western styles. This style suits taller men so if you are in the shorter frame we would suggest you to steer clear of such silhouettes. This one is priced at INR 50,023. We would say this piece is truly a steal at this price. This fiery piece is for the men who are not afraid to wear colour. We think this one would be perfect for both Mehendi as well as Sangeet. It comes with a printed pocket square. You can team it up with mojaris for an easy breezy look. Its priced at INR 58,240. We love this statement kurta set for sure. 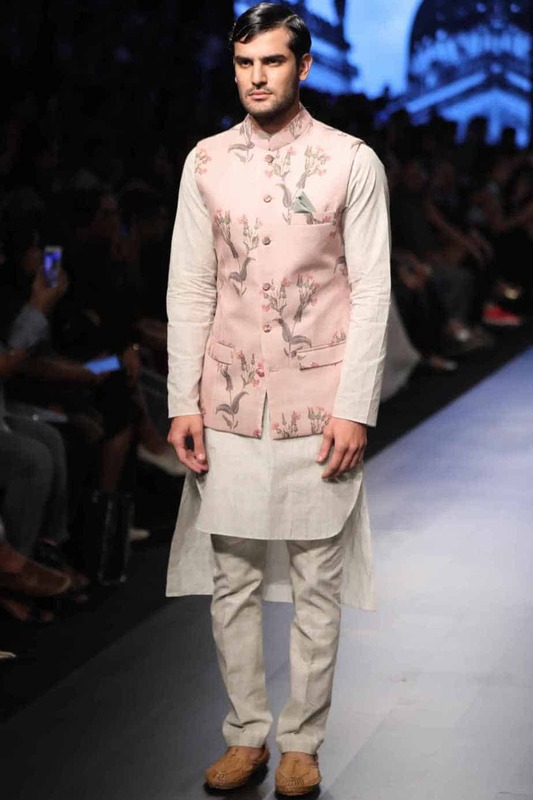 This Embroidered waistcoat with a floral printed dhoti is such a unique piece. This design is perfect to wear for a Sangeet or a beachside wedding. This outfit is perfect for a daytime beach destination wedding. This is priced at INR 81,760. 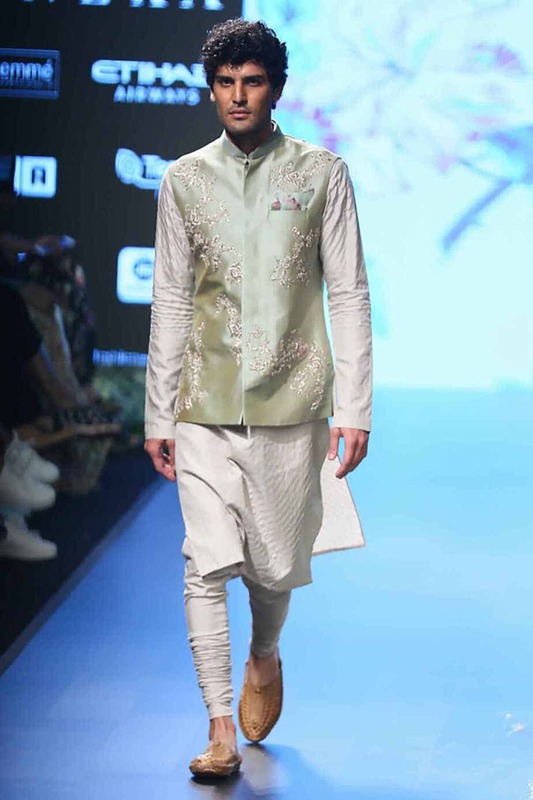 This unique outfit with a beige kurta and floral pant with the jacket is priced at INR 38,916. 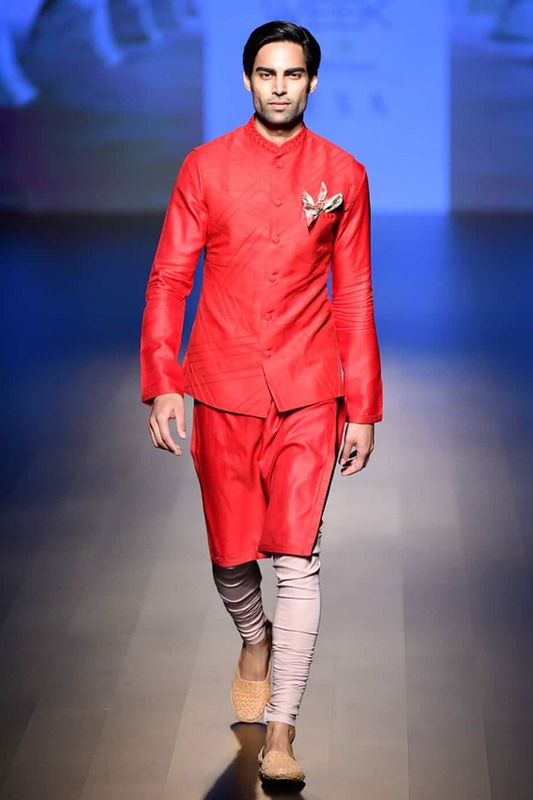 This outfit featuring Kurta, churidar with asymmetric placket bandi looks traditional but still has hints of modern in it. We think it would be perfect for a Mehendi function. It is priced at INR 69,000. 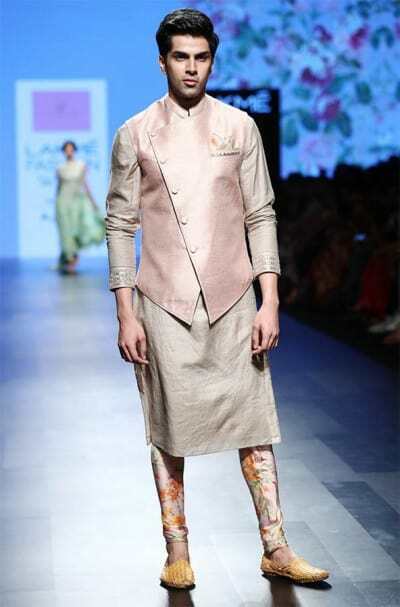 This Kurta set with an asymmetric bandi in blush pink is a great choice for a summer wedding. It is priced at INR 59,360. 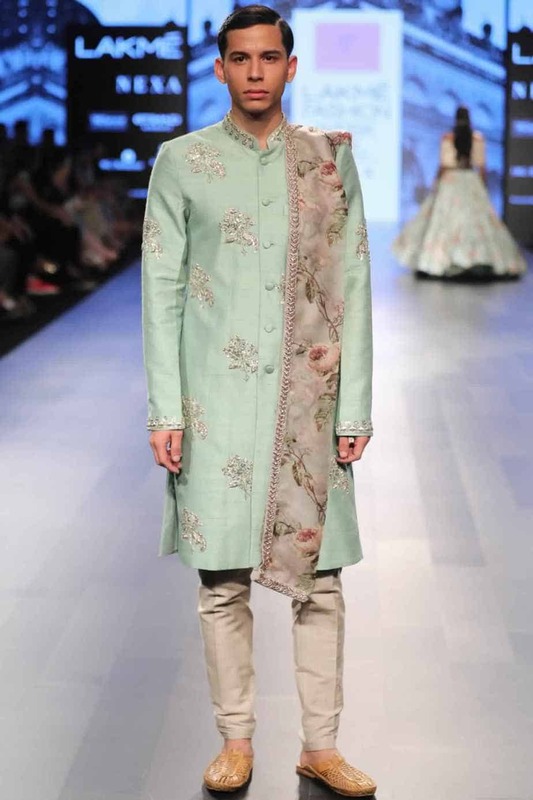 This Pastel sherwani with floral dupatta is the perfect pick for a summer wedding be it during the day or night. It has embroidered motifs on the placket and at the sleeves. It is priced at INR 92,960. These kurta, chudidaar sets paired with contrast embroidered Nehru jackets with pocket square detailing are priced at INR 77,000. 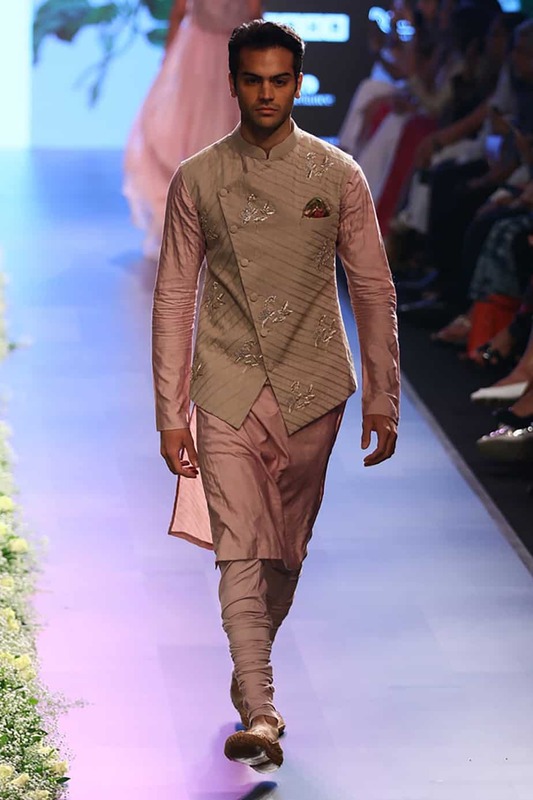 We love this floral embroidered sherwani for the groom. 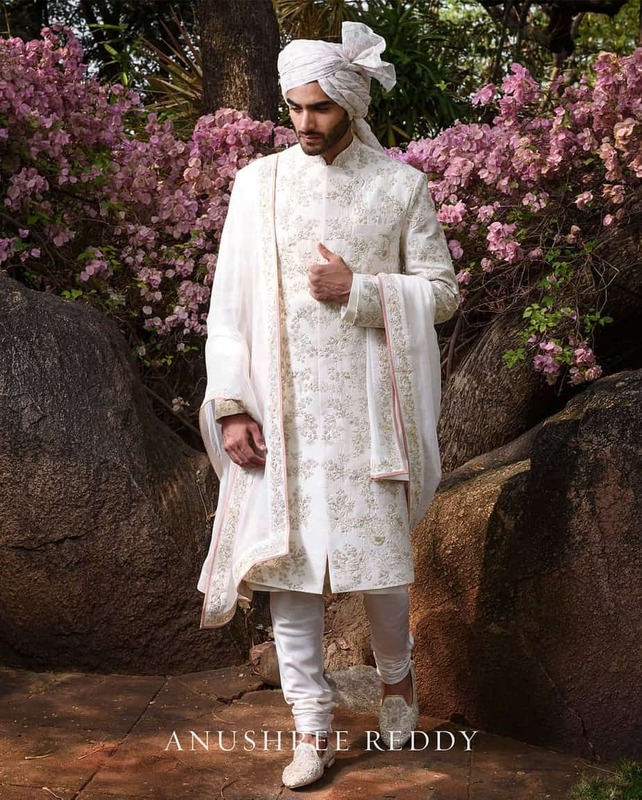 We can hardly take our eyes off this Royal ivory sherwani with embroidery and a stole. It’s a perfect summer wedding dress for the groom. 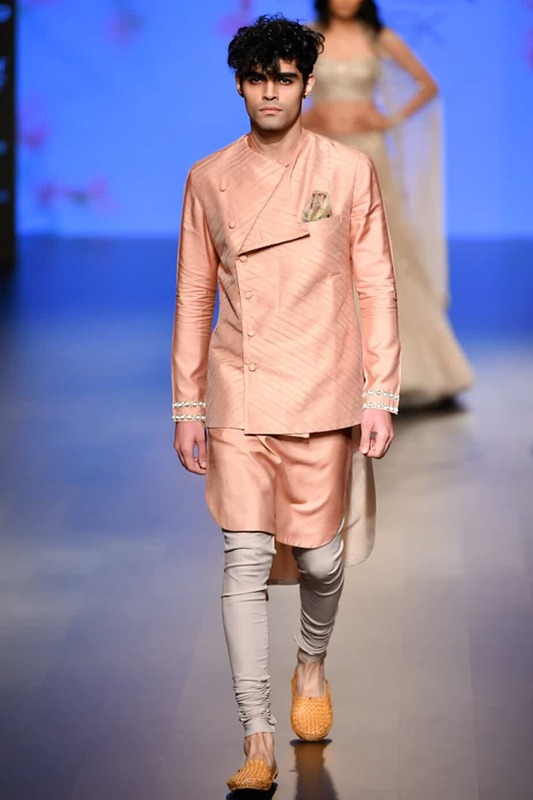 You can buy Anushree Reddy Menswear collection online at Aashniandco and Vesimi. In case you cannot find some of the designs on these websites you can also visit the designer’s store in Hyderabad.